French brochures and those that are translated from or based on the 'original' French ones often carry a numeric code on the last page or the one before. With just a little bit of imagination and a good administration, the codes can be used to deduct the age and country of origin of the brochure. Not all countries follow the French codes; Denmark, Sweden, Spain are mostly very different, while some other countries appear to have had 'French' codes for a number of years only. 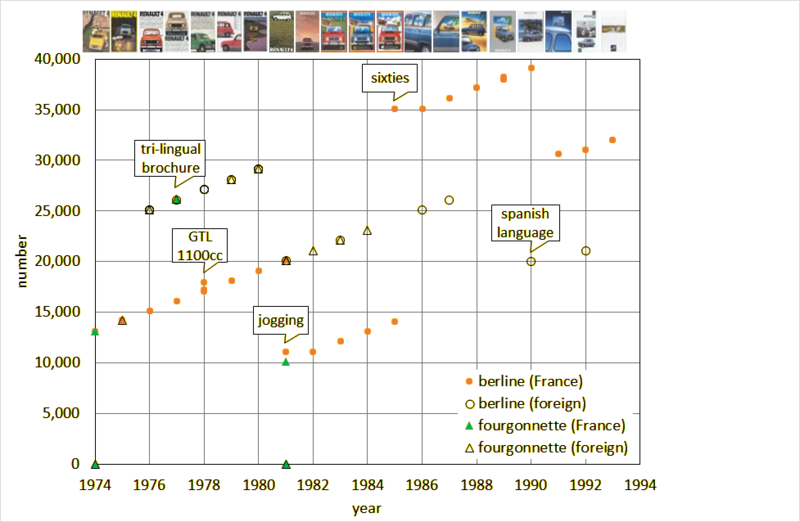 The very first berline introduction brochures ('la Nouvelle/the Remarkable/der Neue/de Nieuwe/etc) ones showing the red car without ribble) have a code starting with 45.898 (the large one) or 45.899 (the small one). The code for the drawing with the blue car starts with 45.900, and the Édition Spéciale has 45.902. Subsequently, the introduction brochures with the 'nervure centrale' have 45.928 (large version), 45.929 (small version) and 45.930 (UK version). It is apparent that the leftmost five digits constitute some ranking order. When number 999 is reached in the last 3 digits of this group, the numbering changes to 46 in the first two digits, like for instance 46.013 (La Parisienne). This sequence lasts to 1973 (46.425 for Les Renault 4 1973). On the other hand, during the 1962-1973 period, the fourgonnette brochure codes start mostly with 43. 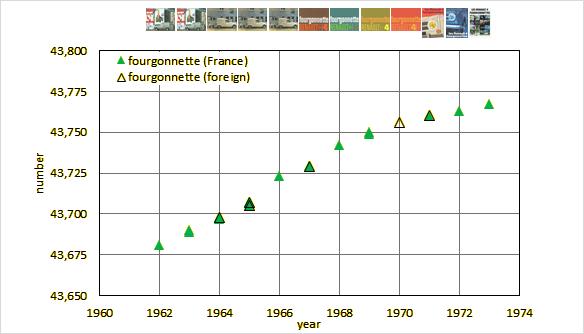 There are two exceptions: 45.921 for the black and white fourgonnette leaflet, and 47.734 for the small brown 1967 brochure (the large version has 43.729). Once in 1973 number 43.767 is reached. The meaning of these numbers is not very clear. They are most often 03 or 04, but also 05, 07 and 09 are observed. The last two digits are a country code. This comes in very handy if you want to know if a French language brochure is from France, the French speaking part of Belgium, Switzerland perhaps, or even French speaking countries overseas. France itself appears to be 03 (although from 1974 on, it becomes 04). 08 is Germany, 09 Uruguay, Mexico etc. Dealer stamps are very useful when trying to figure out from which country the brochure came. Both the French berline and fourgonnette brochures now appear to have similar codes. 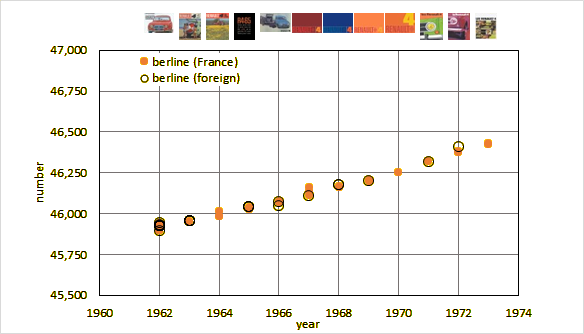 The first two digits are increased by 1 yearly until 1980 (13 to 19): the large 1974 brochure has 13.101, the small one 13.112; for 1975, it is 14.110 (La Renault 4 de 18 à 98 ans), for 1976 15.107 etc. Then, for the period 1981-1985 there is a sudden jump back, and the numbers go from 10 to 14. Lastly, during the period 1986-1990 there is a jump forward, and they go from 35 to 39. The Sixties and Jogging models appear to be slight outliers; they were introduced in May, so one can argue whether they should belong to the next model year (usually introduced in September). For non-French countries, the year codes are apparently 25-29 during 1976-1980, and then back to 20-24 during 1981-1985. After 1985, I know of very few foreign codes, but from 1991 on there appears to be a joint numbering for both France and foreign countries from 30 on. The 1990 foreign code in Spanish is an odd one out? This is the country identifier, similar to those used in the old codes. The most common code for French brochures until 1974. The 1963 brochures translated into Danish and Spanish also carry this code - a slight omission during the translation? French brochures from 1974 on, but also the African La Nouvelle and 1966 brochures have this code, as well as the Canadian 1965 fourgonnette one. A 1977 tri-lingual (!) fourgonnette brochure 'Fourgonnettes, Van and Estate, Furgoneta' in French, English and Spanish has 26.121.04 - according to the 26-code this was regarded as a foreign brochure, possibly Canadian? English language, found with English and Canadian dealer stamps. Obviously in Spanish, with a dealer stamp from the city of Salto for the small introduction brochure. The same code is found on a similar brochure with a Mexican DINA Renault S.A. dealer stamp. Portuguese language, Portuguese or Brazilan? 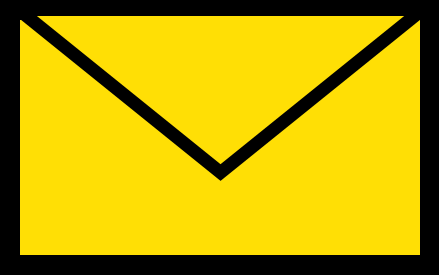 Belgian brochures tend to have yellow Renault logos for both their Flemish and Walloon versions, which differentiates them from the Dutch and French versions. Until 1974 or also later? A peculiar code: two fourgonnette brochures from 1974 ('Renault 4 break et fourgonnette') and 1980 or 1981 ('Fourgonnettes, Break, Pickup Renault 4') carry this code. The latter has extensive information about the DIAC financing, so most likely French. Again an odd code for fourgonnette-related stuff, found on two Utilitaires brochures from 1978 and 1979, both in French. Written in Arabic (!) and observed on the red 1977 brochure.